It’s exclusive, a hobby exclusive, the exclusive national trading card of Minor League Baseball and the exclusive place to find Bryce Harper on his first minor league card, in his Hagerstown Suns uniform. 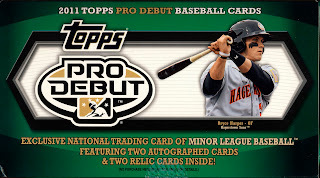 Here is our video box break of 2011 Topps Pro Debut Baseball. That's how box breaks should be not like the 2011 Topps Opening day break on Ustream a few hours ago! lol!